That done, I decided to make some small batches of marmalade, which my husband loves, in the microwave. I figured that, if it was a simple process, I would not have to buy it anymore and could make it from organic products while still saving money. I found a recipe, or more like a guide, really, for microwave orange marmalade in the book "Not Your Mother's Microwave Cookbook" by Beth Hensperger. Normally, the rule of thumb when making marmalade or jam is approximately twice as much sugar as fruit. But Beth's rule is 1 cup sugar to 1 cup of the fruit mix-- so, less sugar, too! And the chopping is done in a food processor, so more streamlining. So, I made two jars (there was a bit left over to sample)-- one with a large navel orange and a lemon, and one with 3 medium-large lemons and some candied ginger. Both are delicious and each took about 15 minutes from start to finish-- I'm not kidding! Makes a little over 1 pint. 1 tablespoon golden syrup (a sugar product) per cup of processed fruit (this replaces the 1 tablespoon corn syrup Beth Hensperger called for), to prevent crystallization. If you don't mind a chunky marmalade, you can process the whole fruit in the food processor. If you want it to to be a little more refined, use a zester and zest the orange and lemon first, before cutting the lemon into 8 wedges (remove any seeds) and the orange into 12 wedges and then each wedge in half. Whichever way you do it, add the fruit to your food processor and pulse until the fruit is in tiny pieces, but not pulverized. Pour it the fruit into a 2 qt. ceramic or Pyrex measuring beaker/batter bowl. Take note of the measure of the fruit (measure it first if your bowl does not have measurement indications) and add an equal amount of sugar and then the golden syrup as instructed above. Stir well. Microwave (in a 1200 watt oven) on 100% power for 2-3 minutes and then on 10% power for 3-6 minutes, depending upon the amount. The fruit peel should be softened and the liquid a bit thickened. NOTE: I cooked this batch for 2 minutes at 100% power and then 6 minutes at 10% power. If your oven has less wattage than mine, you may need to add a little more time onto each section of cooking. If it is 1300 watts or more, you may have to use less time. Pour the mixture into a sterilized pint jar or two sterilized half-pint jars and secure the lids. Let cool a room temperature and then refrigerate (or water-bath can as per canning instructions for preserves). Nutrition (per tablespoon): 38.7 calories; 0% calories from fat; 0.0g total fat; 0.0mg cholesterol; 1.6mg sodium; 14.2mg potassium; 10.1g carbohydrates; 0.3g fiber; 9.6g sugar; 9.9g net carbs; 0.1g protein; 0.7 points. I'm thinking that this marmalade would be a great base for a savory grilling sauce. Follow the instructions in the main recipe above. For this version, I cooked it at 100% power for 3 minutes and 10% power for 5 minutes. Nutrition (per tablespoon): 51.7 calories; 0% calories from fat; 0.0g total fat; 0.0mg cholesterol; 2.0mg sodium; 15.9mg potassium; 13.9g carbohydrates; 0.5g fiber; 10.9g sugar; 13.4g net carbs; 0.1g protein; 0.9 points. There's a book I have on order called "One Pot of Jam from Your Microwave (Quick and Easy)" by Sonia Allison (author of "One Pot Luxury Preserves from the Microwave", which is out of print but still available 2nd hand.) I have ordered it from my library. Both should be interesting! 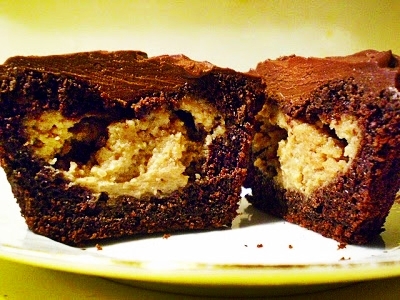 I haven't posted any dessert recipes for a while, so, it being National Peanut Butter Day and all, I decided that the time has come to blog a recipe I devised in 2007 for my now-defunct Vegan Feast newsletter. (Of course, you can use another nut butter if you or a loved one or guest is allergic to peanuts.) These babies are not what I would call low-fat, but, at 225 calories each, they are not excessively rich either. (The "triple-threat", BTW, is cocoa powder, semisweet chocolate, and chocolate liqueur.) Mmmmmm! A delightful treat containing two of my favorite things—chocolate and peanut butter. I kept the fat as low as I could, while still producing a moist, triple-chocolaty, peanuty-rich treat. My guests and granddaughters gobbled them up. PS: They are not as complicated as they look! The Filling and Ganache can be made ahead of time. You may have to bring the Ganache to room temperature to spread properly if it is quite cold. Process all of the ingredients together in a food processor until very smooth. Scoop into a bowl and refrigerate until time to use. Process the chocolate finely in a DRY food processor. Leave the chocolate in the processor. With the motor running, pour the hot soy creme in through the feed tube. Process until the mixture is smooth. Add the liqueur and process briefly. Scoop into a bowl, cover and cool. Preheat the oven to 350°F and place 2 racks in the lower and middle third of the oven. Line two 12-cup muffin pans with parchment or silicone cupcake liners. Place the cocoa powder in a medium heatproof bowl. Add the boiling water and whisk until a smooth paste forms. Whisk in the "buttermilk" until well-combined. Set aside. In another medium bowl, whisk the flours with the baking soda, baking powder and salt. Stir in the 4 oz. chocolate chips. Set aside. In a large mixing bowl, using an electric mixer, beat the vegan butter and applesauce with the sugar until it's light and fluffy, about 3 minutes. Beat in the soy yogurt and and vanilla. Mixing: To Mixture C (“Butter” Mix), add 1/2 of Mixture B (Dry Mix), stirring with a wooden spoon; then add half of Mixture A (Cocoa Mix), stirring again with a wooden spoon. Repeat this procedure once again with the last halves of Mixture B and Mixture A. Do not overbeat—blend just until the mixtures are blended (like muffin batter). Carefully spoon 1/2 cupcake batter into the lined muffin cups. Scoop about 1 Tbs. of the Peanut Butter Filling into the center of each muffin cup of batter, pressing it gently down into the batter a bit. 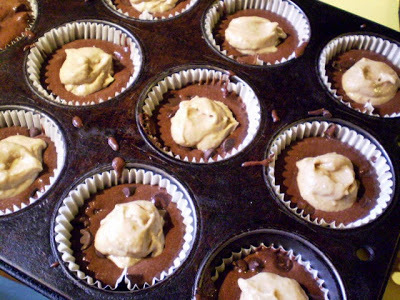 When you have filled all the muffin cups, spoon the remaining batter evenly over each mound of Peanut Butter Filling-topped chocolate batter, completely hiding the filling. Bake for 20 to 22 minutes, or until the cupcakes are springy and test done when a cake tester is inserted into the side of one. (They may have sunk a little in the center, but that's okay!) Let the cupcakes cool in the pans for 5 minutes, then transfer them to wire racks to cool completely. 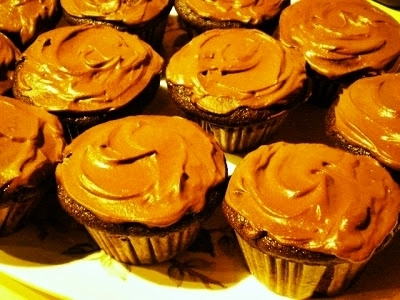 When the cupcakes are cool, ice them with the Ganache (you may have to bring it to room temperature to spread properly if it is quite cold). Nutrition (per cupcake): 225.9 calories; 33% calories from fat; 9.1g total fat; 0.0mg cholesterol; 154.7mg sodium; 211.3mg potassium; 35.4g carbohydrates; 3.0g fiber; 18.6g sugar; 4.5g protein; 4.7 points. Yesterday we had a vegetable lunch. I needed to use up half a large sweet potato and a chunk of butternut squash, and I wanted to use at least half of a last cauliflower that I had in the fridge, lest it stay there too long. 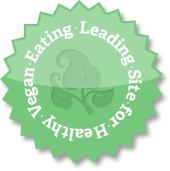 So I altered a couple of recipes that caught my eye on Pinterest to suit our taste-- veganizing one, cutting down on the fat, adjusting the seasoning, and using different cooking methods. Both were delicious and I will make them again. I used different seasoning and less oil (of a different type), sweet potato in addition to the squash, didn't marinate for very long, and used my oven's broiler instead of a grill. Note: You can use only sweet potatoes or only squash, if you prefer. Mix the Grilling Sauce together in a small bowl. Place the sliced vegetables in a large zipper-lock bag. Pour in the sauce, zip up the bag and shake well. Leave on the counter while you prepare the pan and broiler. Heat the broiler on High. Move the oven rack to the 2nd level down (about 6 inches from the heat source). Spread the vegetables and the sauce in one layer on a small baking sheet with a rim. Make sure that the sauce is evenly distributed. Place under the broiler heat and cook for about 7 minutes, or until the vegetables look shiny and a bit charred. Turn the pieces over and redistribute the remaining sauce so that the pieces get coated more-or-less evenly. Broil again until the second side look shiny and a bit charred as well, and the vegetables are tender inside. I used less oil and more olives (kalamatas instead of oil-cured, because that's what I had), red onion instead of white, a bit more vegan cheese, and a little non-dairy milk for moisture; and did it all in the microwave, as I was in a hurry (and it saves energy and nutrients) and the oven was being used for the grilled squash and sweet potato. Cut the cauliflower into small flowerettes. Place them in a microwave-safe casserole that you are going to use for serving. Add a couple of tablespoons water, cover and microwave on high for about 4 minutes. the cauliflower will still be a bit crunchy. Keep covered while you prepare the other ingredients. In a microwave-safe pie plate, mix the olive oil, onions and garlic. Cover with a microwave-safe pot lid or another Pyrex pie plate upside-down). Sprinkle with a little salt. Microwave on high for about 5 minutes, or until the onions are soft. Uncover the lid on the casserole and drain any water from the cauliflower. Add the onions, etc., the olives, half of the grated cheese and Parmesan sub, and the non-dairy milk. Mix well. Sprinkle with salt and pepper to taste. Sprinkle the top with the remaining cheeses. Cover and microwave on High power for about 10 minutes, or until the cauliflower are done to your liking. Sprinkle with the parsley and serve. I decided to update my New Year's Hoppin' John this year-- to make it more flavorful and a little spicier. I've been using the same recipe that I devised back in the 90's (vegan Hoppin' John recipes were not so easy to find back then), so I thought it was about time for a makeover. "There are several universal customs that link New Year's festivities from country to country-- loud noise-making; partying, feasting and drinking; dressing up in costume or new clothes; paying off old debts; and eating beans! Yes, strange as it may seem, there is a long association between beans and good luck on New Year's Day. In Japan it has been the custom for the head of the house to go through all of the rooms at midnight of New Year's Eve scattering roasted beans about and chanting "Oni wa soto, fuka wa uchi" ("Out with the demons! In with the Luck!"). In Northern Europe families or communities selected a King, and sometimes also a Queen, of Bean, "the nobilities of Misrule", who presided over games and revels. In the Southern United States even today it is the custom [and it has obviously spread to other parts of North America!] 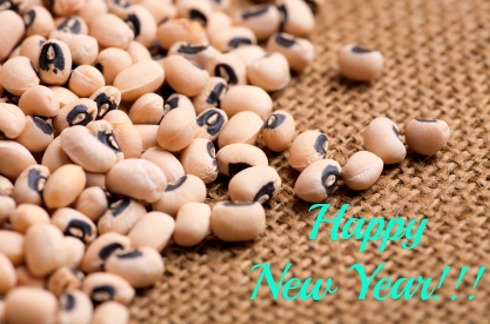 to eat black-eyed peas, usually in the form of a dish called Hoppin' John, for good luck in the New Year. The spicy black-eyed peas and rice (with the greens that often accompany them) were brought to the South by African slaves. The English-Irish-Scottish slave-owners brought their Celtic and Anglo-Saxon customs of eating beans for good luck and hopping over the dying embers of New Year bonfires, also for good luck. It seems reasonable to assume that this is the origin of the name Hoppin' John (the Anglo-Saxon word "hoppan" meant a religious dance or leap)-- a blending of African foods and European lore." It should be noted that red peas, cowpeas or field peas, all relatives of black-eyed peas, were and are also used in Hoppin' John, but black-eyed peas are more easily available to most North Americans. Here is a little additional lore: "In the American South, greens are added to black-eyed peas or hoppin' John (black-eyed peas with rice). The symbolism is straightforward: the greens represented dollars and the black-eyed peas coins. Dried beans, garnished or plain, represent the changing over of years, for they can be stored throughout the winter and then be planted to create the harvest." And even more: "The "good luck" traditions of eating black-eyed peas at Rosh Hashana, the Jewish New Year, are recorded in the Babylonian Talmud (compiled circa500 CE), Horayot 12A: "Abaye [d. 339 CE] said, now that you have established that good-luck symbols avail, you should make it a habit to see qara(bottle gourd), rubiya (black-eyed peas, Arabic lubiya), kartei (leeks), silka (either beets or spinach), and tamrei (dates) on your table on the New Year." However, the custom may have resulted from an early mis-translation of the Aramaic word rubiya (fenugreek)." We ate cornbread instead of rice with the peas this year and I just read this tidbit: "One more from the Southerners: eating cornbread will bring wealth." That makes me feel better (just kidding)! So, here's my new recipe, and below that is a delicious soup I made with the leftovers. 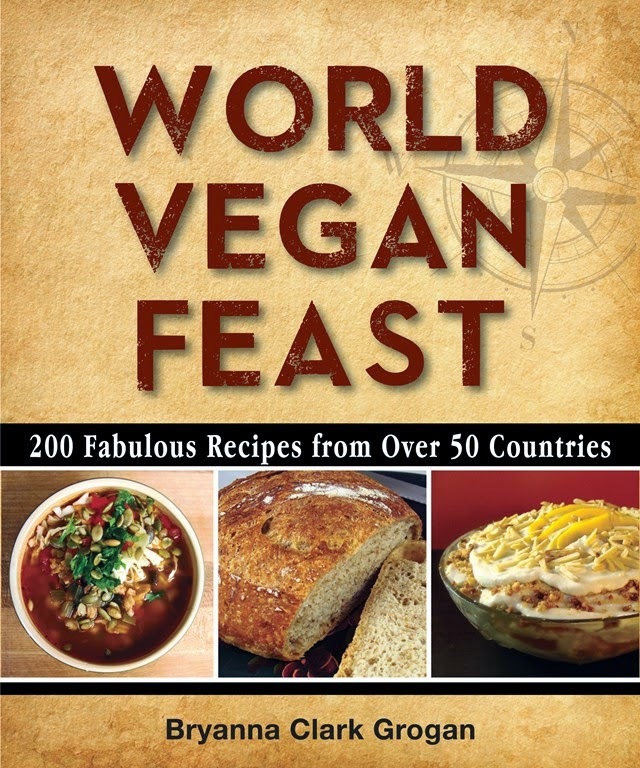 Optional: 1/4 cup vegan "bacon bits" or 1 cup of chopped vegan "ham"
In a large pot, mix together the broth, black-eyed peas, optional "bacon bits" or "ham", and liquid smoke. Bring to a boil. While that's heating, saute the onions, garlic and chili flakes in the dark sesame oil in a heavy nonstick, cast iron or hard-anodized skillet over medium-high heat until the onions are softened. Alternatively, you can soften them in the oil in a covered microwave-proof casserole for about 6 minutes on 100% power. Add the softened onions to the pot with the black-eyed peas. Add the sliced sausages, tomato paste and ketchup. Bring to a boil, turn down to a low simmer, cover and cook for about 1 1/2 hours, or until the beans are tender. Serve with steamed long grain brown rice or cornbread, and braised greens. UPDATE: You can make this in the Instant Pot or a pressure cooker. Saute the onions, garlic and chili flakes in the oil in the Instant Pot on the Saute function. 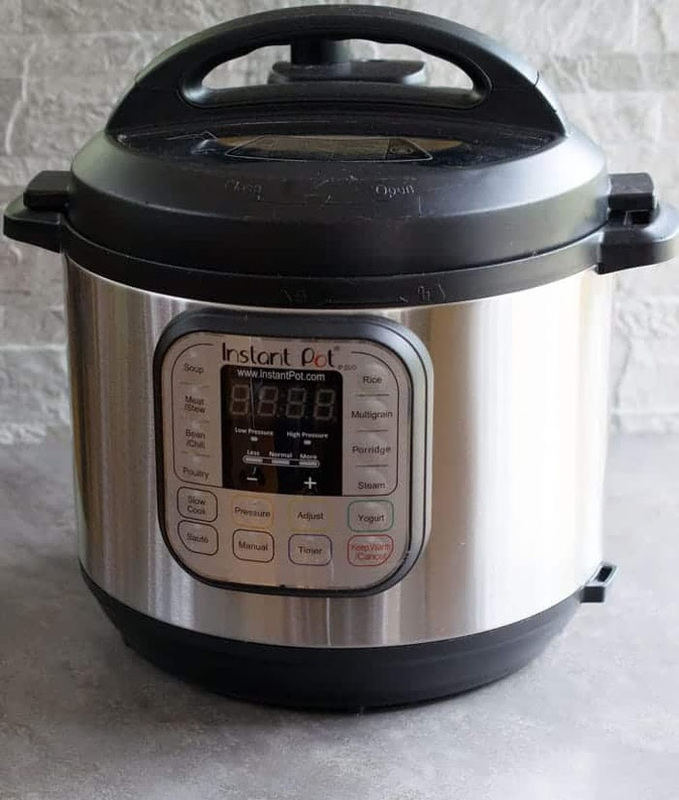 Add the remaining ingredients and cook at High pressure (using the Bean or Manual function on the Instant Pot) for 20 minutes. Let the pressure come down for at least 10 minutes before you release the steam. Mix together the ingredients in a medium pot, bring to a boil, turn down to a simmer, cover and cook for 15 minutes. Stir in the vinegar and taste for salt and chile heat-- add a little hot sauce if you like. 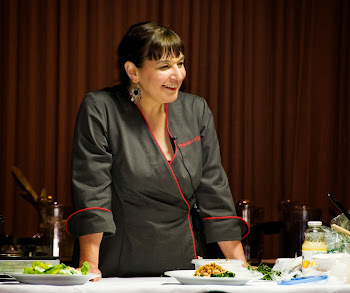 To serve, divide the soup between 4 soup bowls or plates. Measure some of the rice in a 2/3 cup measure. Pack it down firmly. Overturn the measuring cup in the center of each bowl and whack the bottom of it with the heavy end of a table knife to loosen it from the cup. Sprinkle a bit of the smoked paprika across the soup and the rice and serve.